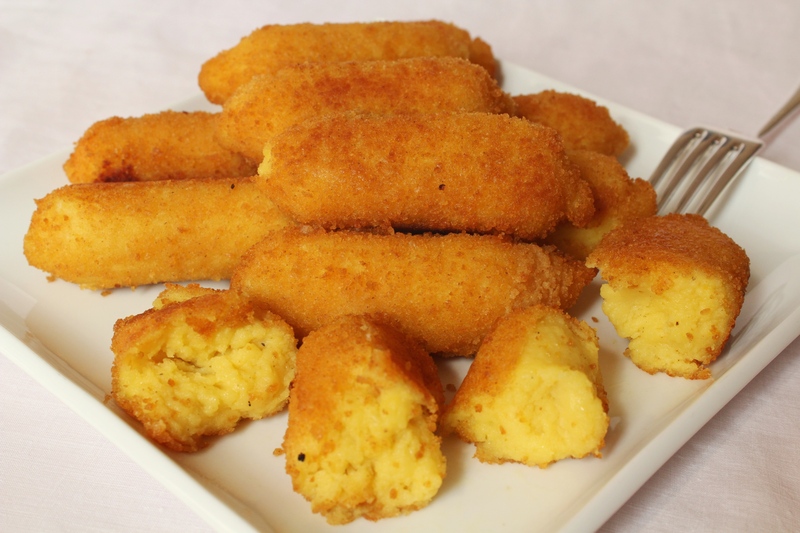 Potato croquette is a small breaded, fried potato roll, usually shaped into a cylinder. It is an Italian classic that can be served either as a tasty appetizer or a fancy side dish. A plate of croquettes becomes something a bit more special when stuffed with cheese or ham, and it can even be served as a main course, delighting both kids and adults. My kids love when I prepare them, they disappear in a blink of an eye! The term croquette originates from the French croquer “to crunch”. Croquettes are easy and quick to prepare, but in spite of this the result is spectacular. The use of simple ingredients, such as mashed potatoes, eggs, Parmesan cheese and spices, provide a soft texture and a delicate and appetizing taste. Of course, frying adds an extra mouth-watering flavor. 4 . In a frying pan (better in a deep fryer ) heat plenty of peanut oil to 180° C (350° F) . If you do not have a cooking thermometer to check the temperature, you can test with a small piece of bread . If after 60 seconds is colored, the oil temperature is perfect. Put 3-4 croquettes at a time into the pan, in this way you prevent to lower the temperature of the oil 5 . When they are evenly gold, remove with a slotted spoon and place on a plate covered with paper towels. Serve hot. Frittata is an Italian-style omelette made with beaten eggs and milk, and enriched with various ingredients such as vegetables, cheese, ham, pasta and herbs. For example in the Neapolitan tradition frittata is commonly made with left over pasta (spaghetti, angel-hair, etc. ), ham and cheese. The word frittata comes from the Italian verb “friggere” to fry. In fact, the egg mixture is usually fried in a frying pan on the stove, but nowadays there is a baked version as well, like my recipe below. Actually, I prefer this method because makes the frittata lighter on the stomach (no frying) and therefore easier to digest. The addition of zucchini makes this recipe a tasty, dietetic and nutritious dish. Zucchini is a rich in water, vitamins (E, C and folic acid) and potassium, while the eggs are highly rich in proteins. 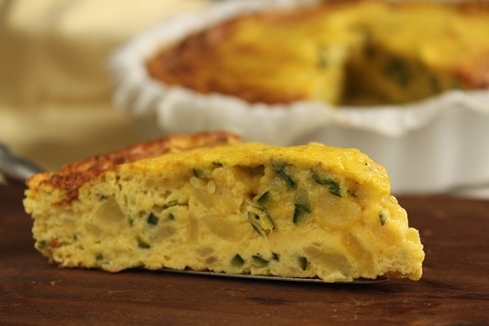 With eggs being one of the most readily available and low cost ingredients, frittata has long been a humble dish. Frittata di cipolle (onion frittata) was a typical workers’ lunch. You can serve it warm as a complete meal, at room temperature or even enjoyed cold the next day for a quick lunch or picnic. There is a technical difference between frittata and omelette: the omelette’s ingredients are placed on the omelette while it is cooking, while when making a frittata you must mix the eggs and the other ingredients together before cooking. You may have heard the expression “hai fatto una frittata” … perhaps understandably, that means you made a mess! This expression comes the fact that frittata is usually made at the last minute with the ingredients available in the fridge, left overs, too!! So the result is not always guaranteed!!! 8. Remove from the oven and allow to cool on a rack for about 7-8 minutes. Serve warm. You can enjoy the frittata cold too. We probably all recognize that pasta is a highly versatile ingredient for preparing quick and delicious meals and can be served at both simple and elegant dinners. The addition of saffron, the king of spices (the most expensive spice in the world by weight!!! ), makes your pasta dish something you will remember and want to make again and again. It is an easy and fast first course that brings a smile to my children’s faces. 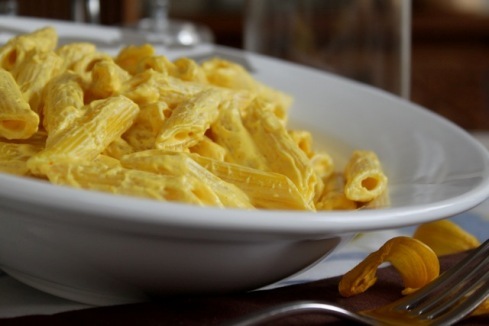 Saffron adds an inviting intense golden-yellow color (don’t forget that we first eat with our eyes!!!) and a special honey-like taste to your recipe. In fact, the word saffron originates from the Latin safranum, which in Arabic signifies yellow. Saffron comes from the stigmas of the flower Crocus sativus (commonly known as Saffron Crocus), cultivated in Asia Minor even before the birth of Christ, then later brought into many Mediterranean countries. Egyptian physicians already cultivated this plant as early as 1600 BC. Today the largest crops in Italy are located in Abruzzo, Sardinia, Tuscany and Umbria. The Aquila saffron or zafferano d’Aquila (Abruzzo), cultivated exclusively in the Navelli Valley, is one of the best saffron in the world for its distinctive thread shape, unusual pungent aroma and intense color. Saffron can be used in many recipes such as rice, pasta, meat, soups and sweets as well. Last, but not least, it is a MUST for a superb Risotto alla Milanese!!!! In addition to its culinary uses, saffron has also many therapeutic properties such as anti aging, anti depressant, anti cancer and cardiovascular effects (contributing, of course, to an increase of sexual vitality). Add saffron to your recipe and put some extra sunshine on your table and into your life! 2.Bring to boil a large pot of salted water, cook the pasta for about 10-11 minutes al dente (read the cooking time on the package). Drain and transfer the pasta to the skillet, toss gently. Before serving sprinkle with ground pepper and Parmesan cheese. Gnocchi di patate (potato dumplings) is an Italian classic. These dumplings are small pieces of potato dough, usually round or oblong in shape, which are boiled in water and then served with various toppings such as tomato sauce and fresh basil, oil olive and grated Parmesan cheese, Bolognese sauce or even Brasato al Barolo sauce. I personally like gnocchi (pronounced gnawk-KEY) with tomato sauce because the fresh taste of the tomato and basil blends well with the starchiness of the potatoes. The texture is soft, and the simple ingredients are just potatoes, flour and egg. The taste, though, is delicate and inviting. Gnocchi is an easy, fast and light recipe to prepare, although you do need to take care in minimizing the amount of flour used. You can enjoy this dish as first course (like we Italians do) or as a main dish, if you prefer. It is an excellent vegetarian dish (it does contain eggs and dairy products, though). I grew up making gnocchi al cucchiaio (a typical Lombard recipe) with my mom, especially on Friday. It was part of our Friday meal, as it is in Verona, especially during the Carnival. 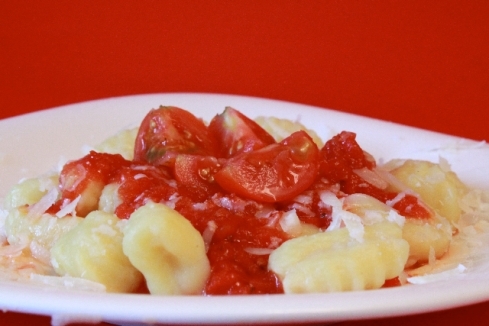 In fact, gnocchi is considered a weekday dish; in Rome it is frequently served on Thursday. In Naples, though, it is known as a festive dish on Sunday. At the time the Americas – and potatoes – were discovered by the Europeans, some varieties of dumplings were already present in the Old World, especially in Lombardy. They were prepared by mixing bread crumbs, milk and almonds and were called Zanzarelli. In the seventeenth century, however, the original recipe underwent some changes in both the composition of ingredients and in its name: it took the name of malfatti and flour, water and eggs were used instead of almonds and bread. With the introduction of potatoes from the Americas, the popularity of potato gnocchi spread and slowly some of the previous varieties disappeared. 4. Puree the sauce with a blender. Season with salt and pepper. Set aside and keep warm. 4. The gnocchi are done as soon as they float to the top, after only about 10-15 seconds (no longer or they will fall apart in the water!!). Remove with a slotted or spider spoon and place on a preheated serving dish. Repeat with the remaining dough and toss gently with the tomato sauce and grated Parmesan cheese. 5. Before cooking the whole batch, I recommend making a couple of test gnocchi to see if the dough holds together. The cooked gnocchi should be firm but not tough and should not fall apart in the water. If they fall apart, you should add 1-2 tablespoons of flour. If they are tough, then you’ve used too much flour! I find that the spoon method is easier and requires less flour in comparison to the rolling method, thereby allowing you to make very tender gnocchi. Lasagna has a long history (see the Lasagne al pesto post) but the Lasagne alla Bolognese recipe, typical from Emilia Romagna, traces its origins no further than the start 19th century when some restaurants in Bologna (Emilia Romagna) began serving this dish to their clients. It was an instant hit! Since then this recipe has been one of the symbols of Italian cuisine and is very popular all over the world, and in my family it is always on the table at Christmas. To prepare good lasagna alla Bolognese the most important thing is the choice of the ingredients: first of all the Bolognese sauce (ragù) should be made using half beef and half pork meat, the tomatoes should be very juicy and tasty, and homemade pasta certainly gives this dish a special flavor and texture that you will not experience using pre-packed pasta. Making fresh, homemade pasta is not too difficult; it’s fast and lots of fun!!! I remember that I loved to make fresh pasta as a kid with my mom, my aunts and my grandmother. It was so much fun kneading the dough; it’s something creative, productive and educational to do with your kids on rainy days and to keep them away from video games and tv reruns. You can enjoy this recipe either as a first course or a main course, and it is also a perfect party dish to serve at family gatherings. 6. Season with salt, pepper and nutmeg. Set aside. Place the flour in a volcano-shaped pile on a work surface (wood is the traditional material) making sure that the “crater” provides a large enough well in the center to receive the eggs. Wash the eggs under running water and crack them into the well. Beat the eggs with a fork for 1-2 minutes, then gradually blend the flour into the eggs, starting from the inner wall of the well and continuing until all the flour and the eggs are completely combined. You have to add flour until the dough is no longer sticky (you may have to use extra flour depending on the absorption characteristics of the flour and on the temperature of the room). Knead the dough for about 15 minutes to form a smooth and elastic ball. This procedure helps develop the gluten in the flour, so your pasta will be springy and al dente when it is cooked. Place the dough in a clean cotton dish towel to rest for about 20 minutes at room temperature. Divide your pasta in 4 equal parts and roll out one part at a time (keeping the rest in the dish towel until ready to work). ROLLING OUT BY HAND. To roll out your pasta you need a wooden pin – mattarello – (about 80 cm long and 4 cm diameter, 37 x 2 in). Dust each piece lightly with flour and roll out to the desired thickness; you should be able to see your hand through it. Work fast because the pasta dries much quicker than you might think. Cut the pasta into rectangular sheets (20 x 10 cm; 8 x 4 in) and let them rest for about 10 minutes on a cotton dish towel. ROLLING OUT BY MACHINE. A hand-cranked pasta machine is the best to use. Kids especially love this part. Start out using the widest setting. Run the pasta through for about 6-7 times until the dough is smooth. If the sheet tears dust it with flour. Continue to run each sheet through the machine, reducing the thickness a notch at a time, until you reach the desired thickness and you can see your hand through it. At this point follow the same procedure as for rolling out by hand. 3. Lower the heat as soon as the mixture reaches a slow boil and then continue to cook for about 10-12 minutes, stirring constantly to the right thickness (smooth and creamy). Stir constantly to ensure that it doesn’t stick or burn. In an 11-cup baking pan (23 cm x 18 cm; approx. 9 in x 7 in), spread a paper-thin layer of besciamella. Arrange the pasta sheets side by side, covering the besciamella in the bottom of the baking pan (about 2 lasagna sheets). Cut the pasta, if necessary, to make a complete layer from side to side. Spread some of the ragù (about ⅓) evenly on top of the pasta, followed by a layer of besciamella (about ⅓), some parmesan and another layer of pasta. Repeat this process until you have a total of three layers of pasta and finish with the remaining ragù and besciamella. Bake for about 30 minutes, until top is brown and bubbly. Let it rest at room temperature for about 8-10 minutes before serving. Sprinkle some freshly-grated parmesan on top and serve warm. Note: I recommend starting this whole process by preparing the ragù first. While it is cooking you can make the pasta and then the besciamella sauce. If, instead, you use dry pre-packed lasagna, just refer to the baking time suggested on the package. Pizzoccheri is a homey dish for the cold months, linked to the traditions of the Alpine farmers. The original recipe comes from a small village named Teglio in Valtellina (Lombardy), a well known ski area in the heart of the Alps. The name pizzoccheri seems to derive either from the root of the word, piz (pezzetto, piece of pasta) or from the word pinzare (to staple – to press) referring to the shape of the pasta (short and thin strips). In fact, pizzocheri are a type of short tagliatelle or fettuccine pasta made of 80% buckwheat flour, a brownish-gray flour with a nutty flavor, and 20% wheat flour. The rustic flavor of the pasta pairs well with the smooth taste of vegetables such as Savoy cabbage, potatoes and the intense flavor of the Valtellina’s cheeses, such as bitto and casera DOP (Protected Geographical Status). Casera cheese is made from partially-skimmed cow milk, and its origins date back the sixteenth century. It has a nutty and sweet taste; instead bitto cheese has a stronger and more intense taste due to the presence of goat milk (about 20%). Pizzoccheri is by no means a light dish, but at the same it is a hearty and tasty treat, especially after a strenuous day on the ski slopes. It is an excellent vegetarian dish (it does contain dairy products, though). You can enjoy it as first course or as a main dish. Heat the remaining butter with the sage and the other garlic clove in a small pan over a medium flame. Remove the garlic clove. Put half the pasta and vegetable mix in a heat resistant serving dish. Cover with half of the bitto and half of the casera cheese. Pour half the butter and sage on top, then sprinkle with half of the parmesan cheese. Season to taste with freshly ground pepper. Repeat this step with the remaining products. Serve hot! It is important that the pasta and the vegetables are hot to melt the cheese. To melt the cheese thoroughly you can also put the pizzocheri in a preheated oven at 170°C (350°F) for 4-5 minutes. The term rice refers to the seed of the Oryza sativa plant. The Chinese were already cultivating this plant 12,000 years ago! It spread slowly to North Africa and Europe. This cereal arrived in the North America, first in South Carolina around 1700, probably from Madagascar. In Italy the first rice farmers were monks in the Piedmont region, and this grain was initially used as a medicine for to maintain the normal digestive functions. Rice is an excellent source of fuel for our body. It is easily digested and so the energy it supplies quickly becomes available to our working muscles, brain and body organs, like the heart and liver. In fact, rice is rich in starch (more than 75%), in vitamins (mainly B group) and some minerals (calcium and iron); instead, it contains few proteins (only 6-7%). Much of the Italian harvest is used for making risotto, a starchy rice, in the northern regions of Piedmont, Lombardy and Veneto. Risotto is a versatile dish, and its character changes depending on what you add to it. For example, zucchini flowers make a wonderful spring-time risotto. Cook a champagne risotto, with passion!, for a special romantic encounter. This recipe, with porcini mushrooms, is a classic Autumn dish, and it has a rich, aromatic and delicious flavor. You prepare the mushrooms the same way for both this risotto and the roast filet. Clean the porcini (see Tips, below), and slice the mushrooms vertically into 2 mm (⅛ in) strips. In a large saucepan over medium-high heat sauté the olive oil and the garlic. Stir in the mushrooms, salt to taste, cook approx. 7 minutes over medium heat. Continue to cook for 1-2 min. over a high flame. Add the parsley and set aside. Set aside a few spoonfuls of mushrooms and add the rest.Cook for about 2 more minutes. The end of the cooking is critical for the final texture of the dish, so when the rice is nearly tender to the bite, but with just a hint of resistance (al dente), and the liquid you have added up to this point has been mostly absorbed (the risotto should still seem a bit “soupy”), add the Parmesan and butter to taste, about 2 T.
Remove your risotto and mushrooms from the heat. At this point, keep stirring the risotto to blend in the cheese and butter. You can also add some salt and freshly ground pepper to taste. Let it stand for 1 or 2 minutes. Arrange the risotto on a serving dish, place the remaining mushrooms on top and serve immediately (plan your timing well – it is very easy to overcook risotto!). Eggplant, also known by its French name aubergine, is a vegetable long prized for its beauty as well its unique, pleasantly bitter taste and spongy texture. It originates from Asia, and the first one imported in America was round and with a yellowish-white color (like an egg!). The Italian name melanzana means” mela insana” (insanity-apple), because when it was first introduced in Italy (around 1500) people thought that this vegetable was noxious and could cause mental and intestinal disorders. Notwithstanding this dubious start, eggplant is, in any case, a delicious vegetable that can be enjoyed grilled and marinated, stuffed, roasted or fried. I like to cook and eat “insanity apples” in a wide assortment of recipes. In addition being an important source of fiber, vitamins and minerals, eggplant also contains phytonutrients, many of which have antioxidant properties and protect us from a variety of diseases. Melanzane alla Parmigiana, a symphony of Italian flavors, is a appetizing main dish made of eggplants, tomato sauce, Mozzarella and Parmesan cheeses, and is flavored with fresh basil. It is not know if the name Parmigiana means “melanzane all’uso di Parma” (eggplant from Parma, the city of Parmesan cheese), or if it comes from Parmiciana (par-mee-CHA-na), a Sicilian word referring to the louvered shutters made of overlapping wooden strips, recalling the arrangement of the eggplant slices in the pan. As far as I know, Sicily is where you can enjoy the most delicious and authentic eggplant Parmesan. Wash the eggplants under cold water. Cut off the ends and slice them vertically into thin (4 mm, ¼ in) slices. Arrange one layer of slices in the bottom of a large colander and sprinkle with kosher salt. Repeat this procedure until all the eggplants are in the colander. Weigh down the slices with something heavy, (for example three plates) and let them drain for at least one hour. This step helps release some of the moisture before cooking. Bake covered with aluminum foil for about 30 minutes. Remove the aluminum foil and bake for an additional 10 minutes. Let it rest at room temperature for about 10-15 minutes before serving. Sprinkle some grated Parmesan cheese on top and serve. Lasagne, one of the most popular Italian dishes, has a long and interesting history. A popular tradition traces its origin to the ancient Greeks. In fact, the name “lasagna” is actually not Italian at all! It comes from the ancient Greek language and means dish or bowl, but over time, the term lasagne has come to refer to layers of thin pasta that are cooked with and separated by different ingredients such as meat, fish, vegetables or cheese, as well as besciamella, or béchamel, sauce, of course. You have may tried the traditional Lasagne with Bolognese sauce, but maybe not the Lasagne al pesto that I am going to present today. The pesto sauce makes lasagna even more special and delicate, a tasty delight for your palate, and is an excellent vegetarian dish (remember, however, that it does contain eggs and dairy products). You can enjoy this dish as a first course (like we Italians do) or as a main dish. Preparation time: 1 ½ hrs. Baking Time: 30 min. 4. Add the Parmesan cheese and pulse until blended. Add a pinch of salt to taste and set aside. 5. Remove from the heat. Mix well the besciamella sauce with pesto. In an 11-cup baking pan (23 cm x 18 cm; approx. 9 in x 7 in), spread a paper-thin layer of besciamella mix. Arrange the pasta sheets side by side, covering the besciamella in the bottom of the baking pan (about 2 lasagna sheets). Break the pasta, if necessary, to make a complete layer from side to side. Spread some of the besciamella (about ⅓) evenly on top of the pasta, followed by another layer of pasta. Repeat this process until you have a total of three layers of pasta and finish with the remaining besciamella. Bake for about 30 minutes, until top is brown and bubbly (follow the suggested baking time on the lasagne package). Let it rest at room temperature for about 8-10 minutes before serving. Sprinkle some toasted pine nuts on top and serve. Fall has arrived, nature has changed its colors from green to yellow, red, brown and ochre, we have exchanged our summer wardrobes for the winter ones and changed the types of food on our tables. It’s pumpkin season! Winter squash is a very nice vegetable, suitable for preparing a variety of recipes ranging from risotto to ravioli, soup to pasta sauce, cakes to croquettes – and even all by itself. Fall’s famous vegetable, in addition to being a tasty part of many recipes, is a very good and healthy choice of food, an excellent source of beta-carotene (pro-vitamin A), a good source of fiber, potassium, iron, folate, magnesium and manganese. Pumpkin is low-calorie and contains lots of water, thus a perfect ingredient to use when slimming down. Cooking time: 1 ½ hrs + 15-20 min. Squash or pumpkin risotto is extremely popular in northern Italy during the cold months. Little wonder, because a good winter squash has a delightful tangy sweetness to it, while the risotto has a splendid creamy texture, perfect on a cold, gray winter day with a nice glass of Italian wine! There are several varieties of winter squash you can use; the one I like the most is zucca di Mantova (Cucurbita maxima, Kabocha). It takes its name from Mantova, a city in northern Italy, where it grows. It has a very sweet, tender flesh, tasting like a cross between sweet potato and pumpkin. It is large, round and squat, dark green and mottled, often with bumpy skin. A good alternative is butternut squash (Cucurbita moschata) that also has sweet and nutty taste. When you choose your pumpkin make sure it is firm all the way around. Preheat the oven to 200°C (390-400°F). Cut pumpkin in half crosswise and scoop out the seeds and stringy material. Wash in plain cold water. Place the pumpkin halves on a baking sheet and bake for about 1-1/2 hours or until the flesh is very tender when pierced with a fork. Don’t worry if the edges are browned. The natural sugars actually caramelize and give it a richer more complex flavor. When it is cool enough to handle, scoop out the flesh and mush it with a fork. Set aside half of the puree. You can freeze the other half in a plastic bag or air-tight container for another risotto. Add the squash and cook for about 2 minutes. The end of the cooking is critical for the final texture of the dish, so when the rice is nearly tender to the bite, but with just a hint of resistance (al dente), and the liquid you have added up to this point has been mostly absorbed (the risotto should seem a bit “soupy”), add the Parmesan and butter to taste, about 30 g (2 T). Remove your risotto from the heat. At this point, stir the risotto vigorously to blend in the cheese and butter. You can also add some salt and freshly ground pepper to taste. Let it stand for 1 or 2 minutes and serve immediately (plan your timing well – it is very easy to overcook risotto!). Note: Cooking pumpkin is much easier than you think. There are different methods: Boiling, Steaming and Roasting. Roasting is my favorite one because it give a richer flavor. You can roast the pumpkin some days in advance and freeze it until you are ready to use it. This process will speed up your risotto preparation time.